Oh, what a month September has been for me! After a near-empty August calendar, this month has been overflowing with writing tasks, events, meetings, and errands, and we’re not done yet! It’s been crazy, but I’m not complaining. It’s months like this when my little book of easy-to-make, tried-and-tested, make-and-freeze recipes comes in handy. My little kitchen and I have been doing well so far. No one has gone hungry (yet! ), despite the fact that I had to be at events for seven straight days last week. Slow clap. Ok. Moving on. My homemade puto has quickly become one of my go-to, weekly staples since our household turned (mostly) gluten-free. It’s super easy to make, takes no time at all, and only requires four ingredients, all of which I always, always have in my pantry – Water, brown sugar, rice flour, and baking powder. 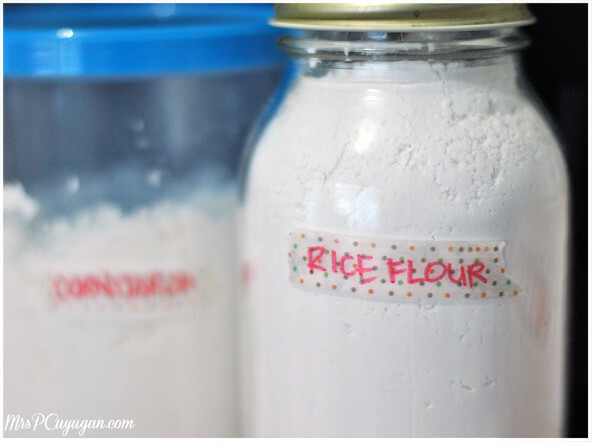 Rice flour has become a pantry staple in our house ever since we shifted to gluten-free eating. I also make sure to always have cornstarch, potato starch, tapioca starch and some kind of gluten-free flour blend on hand. A quick note on baking powder in gluten-free cooking – Not all BPs are GF. Some brands may contain wheat starch. When in doubt, make your own. It’s super easy. Just sift together two parts cream of tartar + 1 part baking soda + 1 part cornstarch. Done. I found this recipe in a Good Housekeeping Fast & Easy cookbook that my mom bought several years ago. Of all the rice flour-based puto recipes I’ve tried, this one has been the best so far. The original calls for muscovado sugar, which I don’t usually have at home, but brown and even white sugar work well, too. I imagine it would be awesome with coco sugar as well. The puto batter is gonna be super runny, so don’t panic. And don’t be tempted to add any more flour in there either. One thing I’ve learned about puto-making is that size matters. I usually get better, fluffier puto when I make them small. I do have mini molds, but I prefer to just use silicone muffin cups for my puto. Then, I fill them up to 1/3 full only. Half-full is already too much. Yes, it makes a difference. Remember: Less is more! This puto cooks more evenly the smaller you make them. 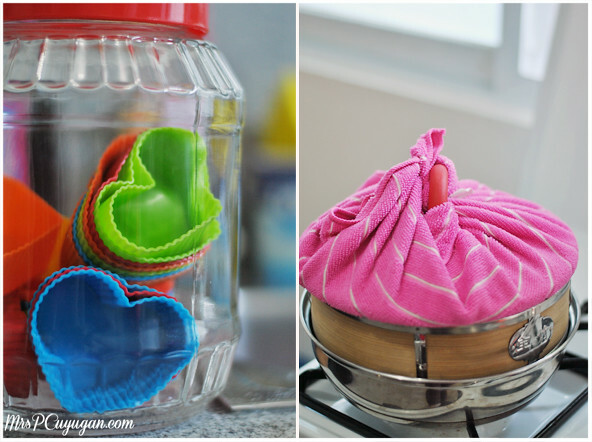 You also want to make sure that no moisture drips from the lid of your steamer into your puto molds. 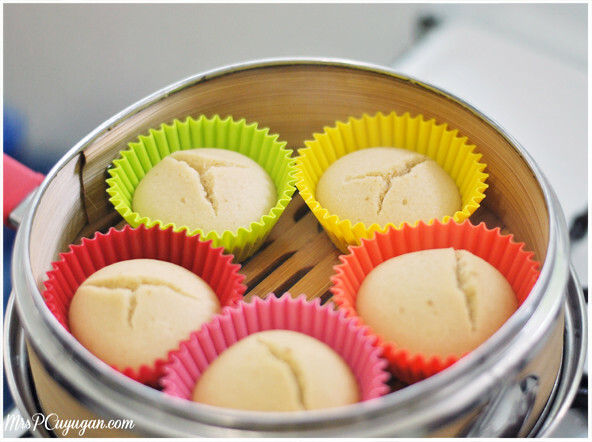 If you’re using a bamboo steamer, then you’ve got no problem. But I use a regular pot with a regular glass lid, so I make sure to wrap that lid with a kitchen towel to absorb moisture. It works like a charm. My steamer looks like it’s wearing a turban. And yes, most of my kitchen things are colorful and cute. I hope to eventually learn how to make gluten-free bread, but for now, this puto serves as our bread substitute at home on days when cravings hit. Though, truth be told, our need for bread has decreased a lot since we made the switch. This whole gluten-free thing hasn’t been half as difficult as I thought it would be. And yes, the results are amazeballs. No more itchy rashes for the kid. No more swollen feet for me. We’ve all been sleeping better. We’re all less sluggish, and less moody, too. Of course, I’m not 100% certain that all this is due to the absence of gluten in our lives. But hey, it seems to work, so right now I’m all for it. A gluten-free, dairy-free, kid-approved, light and fluffy rice cake made with brown sugar. Prepare your steamer. Grease puto molds, and set aside. In a large bowl, dissolve the sugar into the water. 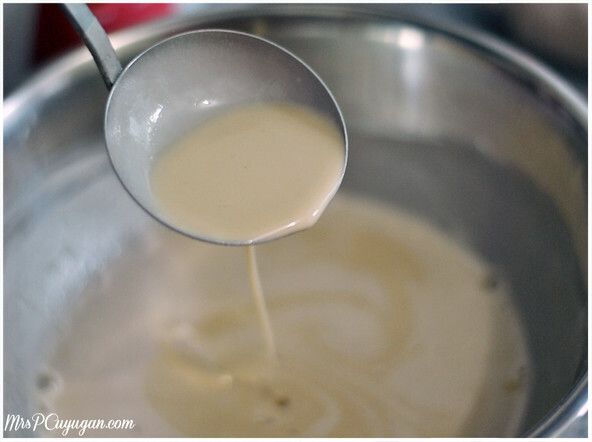 Sift rice flour and baking powder into the water mixture, and mix until well-blended. Pour mixture into the prepared puto molds, and place into the steamer. Steam until a toothpick inserted into the center of the puto comes out clean, about 5-7 minutes for mini puto or 8-10 minutes for larger molds. Remove from steamer and allow to cool. Serve with butter, sugar and niyog toppings if desired. 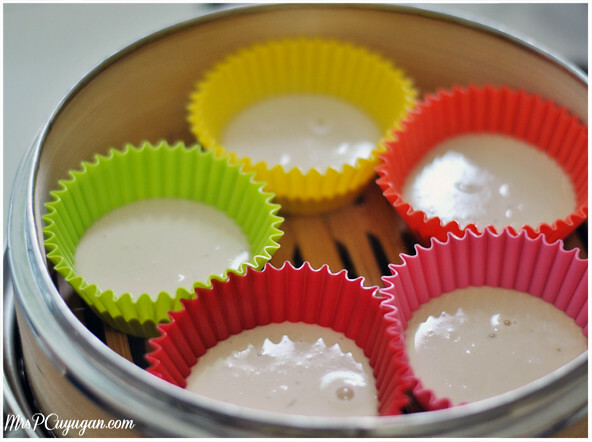 If using regular-sized silicone muffin cups as molds, only fill these to 1/3 full. One final note: DO NOT be tempted to open the lid and take a peek at your puto before the minimum cooking time is done. If you do, you won’t get this nice crack on top. I love eating these with slices of salty cheese on the side. How do you guys like your puto? Thanks for sharing your ‘gluten free Puto’ will try to make this one.